8oz glass chef's jar with wooden spoon. Filled with natural sea salt with infused with black truffles. A wonderful finishing salt for red meat entrees, pasta, potato and egg dishes. Grain size: FINE (0.1mm-0.63 mm). PLEASE NOTE: Not suitable for salt shakers due to size of truffle flakes. 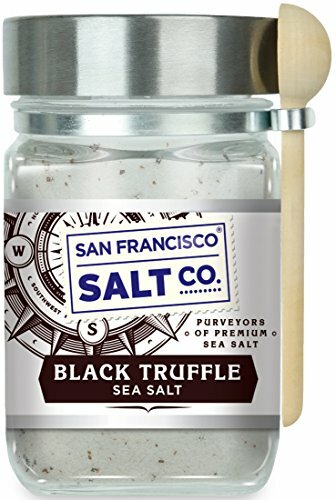 If you have any questions about this product by San Francisco Salt Company, contact us by completing and submitting the form below. If you are looking for a specif part number, please include it with your message.